Welcome to part two of “The need for speed series” on www.karate-community .de The first part of the continuing series showed basic drills to work with the right distance and direction and how to use it successfully. Now we start with the the technique Gyaku Tsuki. The next practices are chosen to improve the important abilities of a sharp reaction and good timing. Please note: These drills presuppose a stable well trained technique Gyaku Tsuki. Good luck. Both partners start in a fighting stance (kamae). Both are inside striking range. One partner is either holding a glove, ball, etc. at eyelevel in front of his body. 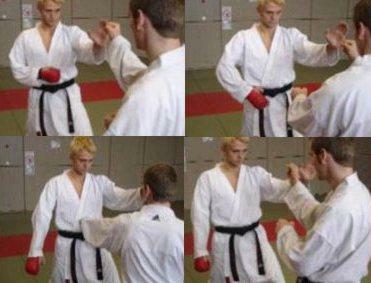 As soon as the glove falls the other side has to execute suri-ashi + Gyaku Zuki (instep with a reverse punch). He must hit the glove at chest level / solar plexus height. If the glove is hit precisely, it should bounce against the other partner's chest. 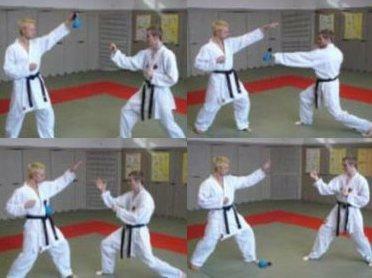 Both partner facing each other in a fighting stance (kamae) keeping normal distance. One partner is holding his hand in front of his solar plexis while wearing a red glove. As soon as this partner moves the gloved hand away the reverse punch (suri-ashi + Gyaku Zuki) is executed hitting the solar plexus as fast as possible. The partner has to vary the rhythm and speed of his hand moving. Variation: Both hands move freely oin front of the solar plexis. Target region is exposed from time to time - Gyaku Zuki De-ai has to be executed as fast as possible. After practising the whole exercise on the place, try to do it in motion. Both partners keep moving in Kamae. Later it’s possible that both partners hold their back hand in front of their solar plexus. So each partner must react and can provoke the Gyaku Tsuki of the other one. Insgesamt waren schon 214136 Besucher (720048 Hits) hier!